Pin it. Bookmark it. Save it. 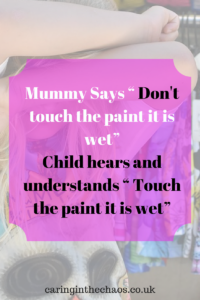 She didn’t have the ‘terrible twos’ which is used to describe a marked change in a child’s behaviour – mainly as they are acquiring a rapid amount of skills and awareness all at the same time. Having a child with Global Development Delay means development happens at different rates, therefore when and how they acquire new skills are not necessarily age related. When your child has a diagnosis, you regularly read the list of things that they could be affected by, ‘challenging behaviour’ is one of the things listed. “Behavioural problems have been reported in as many as 50 per cent of children” with 18q- (Unique 21 and beyond, 2015). What is a challenging behaviour? 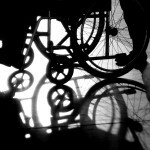 According to The Royal College of Psychiatrists, “The term ‘Challenging Behaviour’ aimed to bring about a shift in perception and practice that would emphasise severely problematic or socially unacceptable behaviours as posing a challenge to carers, professionals and services” (challenging behaviour a unified approach) . This is a question I asked some parents who are currently encountering challenging behaviour, the consensus seemed to be when your child displays behaviour that is massively disruptive, often uncontrollable or unpredictable. Behaviour that is often harming to themselves and others. This could be kicking, screaming, throwing themselves on the floor, refusing to listen, hair pulling, head banging, pinching and more. There is an increased link between behavioural problems and communication issues – if our children can’t explain how they feel or don’t understand what we are saying to them – frustration, agitation and challenging behaviour may be seen. Imagine something is hurting you and you only have limited vocabulary to communicate being thirsty or hungry – how would you eventually react if this thing continued to hurt you? You may hit, kick or scream out in frustration. This is a very simplistic example of what could cause challenging behaviour and must be highlighted that the reasons can be hugely more complex to work out. LanguageRethink and simplify all language. Avoid questions whilst they are in a state of anxiety. 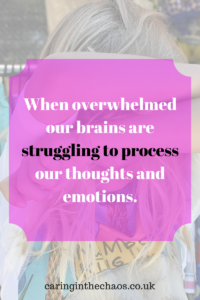 When overwhelmed our brains are struggling to process our thoughts and emotions. In children with 18q- they may have multiple bits of information they are struggling to process (sensory, auditory, visually) as well as trying to understand and react to the words we are saying to them. Our natural reaction when a child is displaying challenging behaviour is to immediately ask what is wrong and or to try discipline them. In these moments give a short and clear message, something that doesn’t require the extra stress of trying to understand what you are asking. Note: They are trying to tell me something with this behaviour – What could it be? As well as simplifying your language think about How you are talking to them – Be mindful of your tone – is it enquiring or agitated? Calm, warm, comforting…? Is your language abstract, vague or clear and concise? Challenging behaviour – Is my language vague? “We are leaving in 10 minutes” – Will they understand what 10 minutes mean or will they pick up on ‘leaving’? Be aware that abstract words like ‘Don’t’ or “Not’ may not always be understood. So the child may become distressed when they are then scolded for touching the paint. 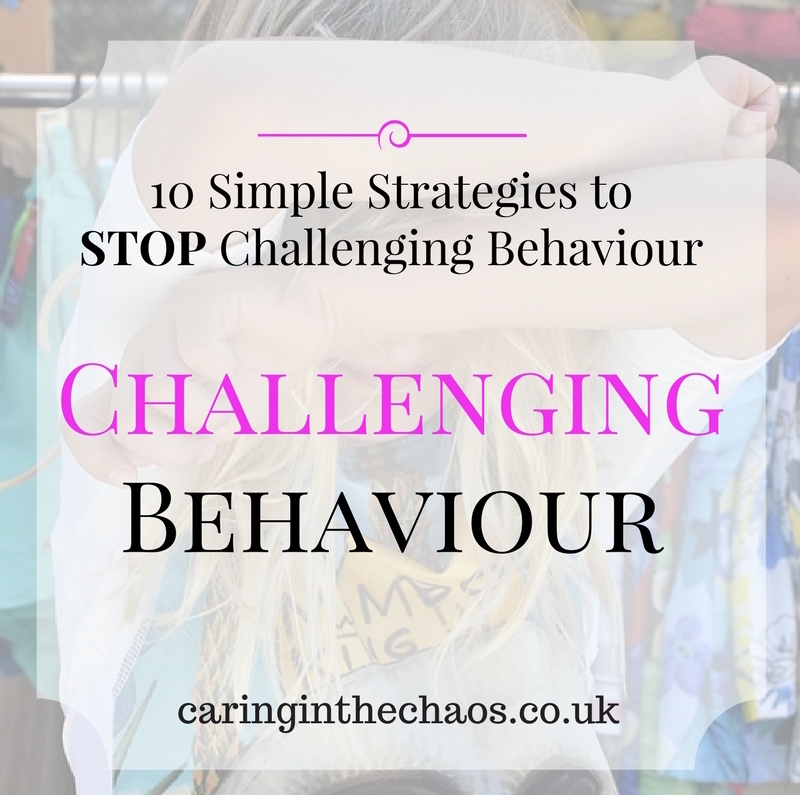 Challenging behaviour – How am I talking to them? In some situations, where their behaviour isn’t placing them or others in harm it can be good to try and ignore the behaviour. Complete and utter ambivalence to the behaviour may create a different reaction as they are not getting the attention they may be seeking from it. If appropriate distracting when you anticipate a change in their behaviour may avoid a complete breakdown in behaviour. This may interrupt the chaos happening in their minds for them. Be mindful of what you do to distract them, for example giving them a favourite toy or gadget may act as reinforcement that disruptive behaviour will be rewarded. 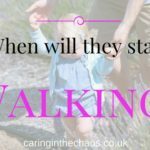 Subtle tactics could be – singing their favourite song, starting a game they like, involving them in a challenge you need their help with, dancing/moving about. 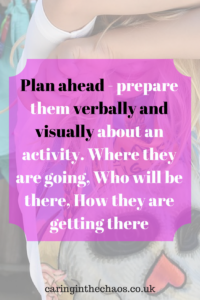 Prepare them verbally and visually about an activity. Where they are going, Who will be there, How they are getting there, E.g by car – lower any possible anxiety or surprises. Walk with your diary/ Notepad. Look for signs of anxiety – This may give you a clue that a change in behaviour might be about to happen. Carry communication cards in the event they start. See if you can capture some of their challenging behaviour on tape – watching it back may give you a clue as to what triggered them. If possible and with support from another adult, looking back at a fairly innocuous interaction may help you see what could be challenging them. In the lead up to and during a challenging moment. Reward good behaviour – even small things, as kids often respond well to praise. No matter how small, this will reinforce correct and acceptable behaviour. EG. In an example of a child that gets overwhelmed sensorily in busy environments. Walk with something you know calms them. Going into a shop that is busy – “Well done for not shouting, here is your toy as a reward, really proud of you.” Give them a calming distraction that may also act as a sensory stimulator to help keep them regulated in a place that might otherwise distress them. You can take it a step further and put a timer on your phone and say “When this rings its time to go!” – So they have an expectation a finality to look forward to. “Screaming is not helpful…” Take their toy/ Reward away. Or a gentler approach could be using a ‘time out’ card to encourage them to calm down. It is important to reward good behaviour and have a consequence to disruptive behaviour. Giving children any extra tools to help express themselves can help aide them. Using visual cards that have a selection of possible reasons that could be upsetting them may be a quick way to help them communicate their needs. Did you know up to “93% of communication can be non-verbal” ? 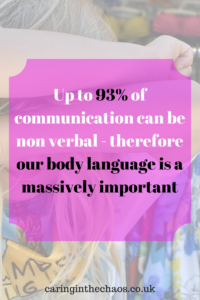 therefore our body language is massively important whilst we communicate with our children. The way our face looks, our hand gestures, having an open or closed stance as well as where we are positioned – i.e. are we towering over them or have we come down to their level to speak to them? All play a big part in helping to dissipate a situation. 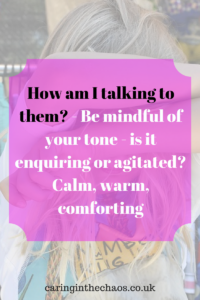 In a situation where your child is being aggressive or lashing out it can be very challenging to react positively to verbally, physically or emotionally actions. Turning our backs, shouting and showing equal anger on our faces can all contribute towards how they are feeling at this time. In these situations, it may not be possible to always employ a positive reaction but it is essential that we try. With Chromosome 18q- our kids can have a number of things that could be bothering them aside from developmental issues. Many have visual, hearing, and GI challenges – it can be hard to remember all of these things – but when there is a frequency of challenging behaviour it is always worth discussing with a paediatrician. They could be experiencing things like headaches, stomach aches, muscle pain, heartburn or more but have no way to explain it – so potentially their reaction could be them describing that to us. This is particularly relevant once children reach puberty as they may be experiencing different hormonal reactions. Check out the Huge Resources for Parents where you can find an extensive list of agencies that can help. 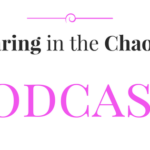 Fellow SEN parent and blogger Yvonne Newbold, is trying to make a difference for parents. Having endured years of challenging behaviour with her son who has multiple disabilities and severe autism she has created workshops, conferences and more on prevention and helpful techniques for families who are dealing with challenging behaviour. 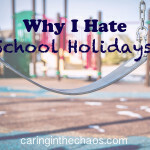 She recently wrote a fabulous post on the basics of Challenging behaviour. Simplify My Language – Have I reduced the information I am asking them to process? Have I given them tools to communicate? – Pecs? Ipad/ Phone apps? Ignore – Is it safe to ignore this? Distract – I sense a change can I distract them? Plan ahead – Have I prepared them for what is about to happen? Record interactions (Where you maybe have an idea that a behaviour may occur and you have support from someone to record, before, during and after) Did I record it? Reward and Remove – Have I rewarded good behaviour? Have I removed something to make them see a consequence to their actions? Use visuals – Have I got visuals to help them? Body Language – Is my body language open, concerned, helpful, enquiring? Medical help – Do they need a check up with hearing? Eyes? Speak to Paediatrician. Professional assistance – Have I sought extra help and advice? What is it like raising a child with Chromosome 18q-? Visit Nadine's profile on Pinterest. Proudly powered by WordPress | Theme: chaos by Mark Manalo.